Peppermint (Mentha piperita) has a strong, clean, fresh, minty aroma. One of the oldest and most highly regarded herbs for soothing digestion, it may also restore digestive efficiency. 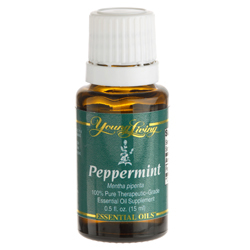 * Jean Valnet MD studied peppermint’s supportive effect on the liver and respiratory systems. Other scientists have also researched peppermint’s role in improving taste and smell when inhaled. Dr. William N. Dember of the University of Cincinnati studied peppermint’s ability to improve concentration and mental sharpness. Alan Hirsch MD studied peppermint’s ability to directly affect the brain’s satiety center, which triggers a sensation of fullness after meals. This powerful essential oil is often diluted before topical application. Peppermint may also be used to enhance the flavor of food and water. For dietary, aromatic, or topical use. When using as a supplement, dilute one drop in 4 fl. oz. of liquid such as goat’s or rice milk.Possible skin sensitivity. If pregnant or under a doctor’s care, consult your physician. Dilution recommended for both topical and internal use. Do not apply neat to a fresh wound or burn. Dilute before using on sensitive areas such as the face, neck, genital area, etc. Keep out of reach of children. Avoid using on infants and very small children.